I totally forgot I had an internet web-blog. 2011, while a pretty excellent year in general (way better than the previous ones) was not a good year for thinking (and most importantly) writing about wine. Did I tell you I went to Champagne? No, I didn’t. I mean, there’s a topic to write about. Lame. Malbec. This is a wine I drink a lot of, but I drink a lot from one producer and that’s about it. So, I can tell you a lot about that one producer, but I can’t tell you much about other malbecs from Argentina or France or whereever. For December, I thought I’d drink more Argentine malbec and make it my wine-of-the-month for this last month of 2011. Most folks are familar with the Argentine malbecs that every single wine selling shop will have - but few outside of the wine-nerd-world know that malbec came from France. In fact there was a quite a bit planted in Bordeaux until a huge frost killed off about 75% of it in the 1950s. The growers there I suspect weren’t too sad about the sudden loss of all that malbec as it wasn’t/isn’t a perfect grape in Bordeaux. Compared to it’s more popular pals merlot and cabernet, malbec needs a lot more sunshine and is more susceptible to disease and frost as it’s a bit thin skinned. So, malbec wasn’t a perfect grape in Bordeaux, but Argentina is a pretty swell place for it. In Argentina you’ll find most of the wineries at the base and slopes of the Andes mountains near the western border. That area of Argentina is dry and hot and what most wine producers have done is to move their vineyards up into the Andes were the temperature isn’t as hot but they still get all the sunlight they need (remember, malbec needs sun). I like to think of malbec as a child who was not doing well in school but was moved to a different one with a different structure and curriculum and now shines. Malbec is still grown in France. There’s a small amount still grown in Bordeaux (where it’s one of the six allowed grapes). For France you’ll see malbec mainly in grapes from Cahors in the southwest of France. The wines always get described as “rustic”. I often find them a bit rambunctious. For me, it’s all black fruit. Plums. Then there is a nice floral note, but these are purpley flowers - violets. 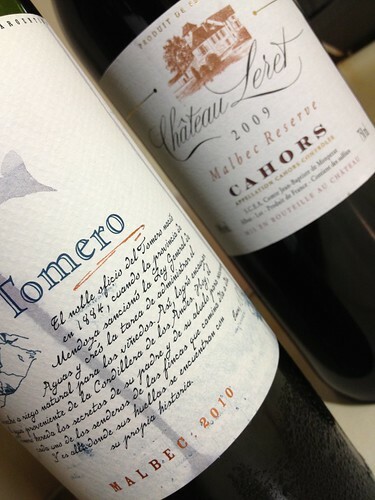 The Argentine malbecs will be softer and more elegant than the examples from Cahors. The color is inky dark. My wife once correctly picked a malbec in a blind tasting just from sight (maybe that isn’t a big deal - but note that she isn’t a wine dork).